Wrap a slice of ham and a slice of cheese around a pineapple spear. 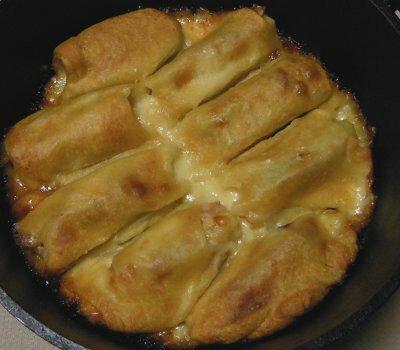 Wrap this up inside a triangle of crescent roll dough and place in dutch oven. Bake at about 350 degrees for 20 minutes. While rolls are cooking, mix pineapple juice and mustard in a small bowl for a dip. When rolls are golden brown, serve with sauce if desired. Let me know how you enjoyed your Hawaiian Swiss Crescents!